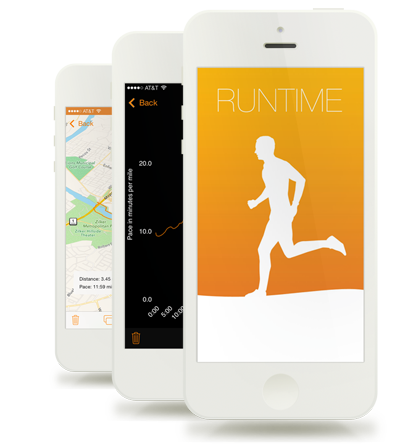 Runtime is a simple run tracking app originally designed from the ground up for iOS 7 and is optimized for the latest fitness features in iOS 8, iPhone 5s and iPhone 6. Use Runtime to track your route, time, speed, pace, and altitude everywhere you go for a run/walk/hike/jog/jaunt etc. Runtime supports the M7 and M8 motion co-processors, which allows you to use Runtime as a pedometer. Open the menu to view how many steps you've taken today and this week. View important stats about the intensity of your workouts. Organize your routes and times into places and view rich 3D map images of each run. Use the cutting edge Flyover feature to get a cinematic tour of your tracked routes! Start your run with the new Stopwatch Widget for iOS 8. Pause and resume while on the go and access your time and distance with just one swipe. Track your activity on the go with a daily step count. The new stats feature helps you spot trends and improve your workouts. iOS 8 Native, Ready to Run. Runtime works great on iOS 8 and on the new iPhone 6. It has a simple and elegant user interface with great features for keeping track of your routes and running information. Please check it out and go out for a run! Runtime collects basic analytics in an anonymous form to help improve the app. This includes general information on how often certain features are used. This does NOT include any personally identifiable information, health data, or location data.